How does your company see its sales process? Is it a funnel? A cycle? A journey? Is it linear, curved, or looped? There are many different ways to visualize the sales process, but one thing we know for sure is that no single shape fits all anymore. Which shape describes your sales process best? It was usually broken up into three sections: Leads, prospects, and customers. Later, more stages were added. These sales funnels tend to stop at the point of purchase, which works well if your company sells washing machines. But if you need your customers to continually return to you to use your product, that sales funnel model needs to change. The Pirate Metrics-style sales funnel accounts for subscription-based business models, but it’s still a little short. It begins with acquisition or the first sign-up, which should really be toward the middle or end of the process. After all, a lot has to happen for a user to find the company, like the company, and engage with the company—all of which happens before that customer signs up. This funnel puts the emphasis on the activation and retention stages—that crucial first week after the first use of the product, during which most attrition happens. 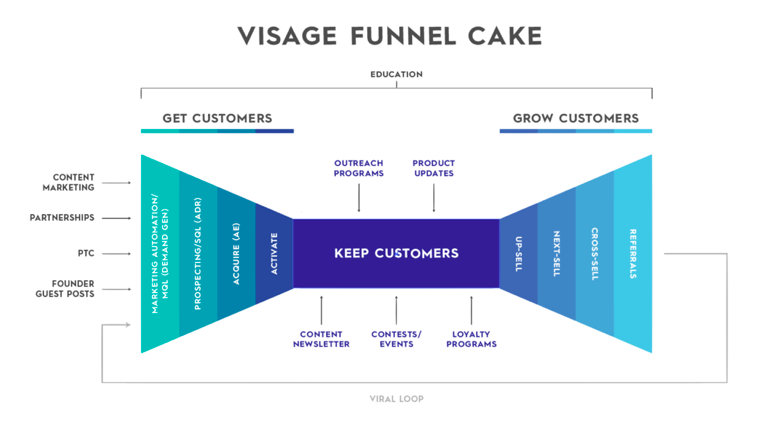 Internally, we use “funnel cake,” and it is essentially Steve Blank’s model from his book, The Startup Owner’s Manual, that you might recognize. We added some specifics that helped us think about the who is responsible on our team for communication at each stage, but it’s essentially an hourglass shape. We’ve turned the sales funnel on its side, then constructed a mirror image that reflects what happens after we get and retain the customer and make them very, very happy. Referrals are the magic that make the hourglass into more of an unending Mobius strip, but referrals don’t always loop back to the beginning of the “Get Customers” sales funnel because, by the time they find you, they’re already interested and curious about what you have to offer. Mapping your sales process into a funnel, hourglass, or Mobius strip is an invaluable step to ensuring your company takes a methodical, organized sales approach. But when you want to see beyond what you already have to find out how to improve upon it, you may want to consider ditching the funnel altogether. Sankey diagrams were originally created to show the flow of energy through power plants, but they might just be the best way to visualize the sales journey visitors make once they find your company website. Tom Tunguz used Google Analytics’ Sankey diagram to see the flow of visitors to his blog. Without a sales funnel, your sales and marketing teams are flying blind. The right funnel can give them the all-important methodical, repeatable, and scalable process to help your business thrive. But don’t forget to look at how your sales process actually works, not just how it’s supposed to work, then iterate accordingly. Get it up on the wall as a visual reminder of your customer lifecycle.